These door handles are typically used on exterior doors, and include keyed cylinders. Typically used for bathrooms. They can can be locked from the inside by means of a small twist knob in the center of the door handle or door knob and, in case of an emergency, unlocked from the outside by a pin like tool that is inserted into a small opening. Privacy sets should never be used on bedroom doors as there is the possibility to panic in the event of fire or medical emergency. Passage door handle sets are used for all interior doors that do not require a lock. It is never a good idea to lock a bedroom door. In case of an emergency some people may panic and may have trouble unlocking the door. If parents or teenagers need privacy a simple hook and eye lock may be sufficient. 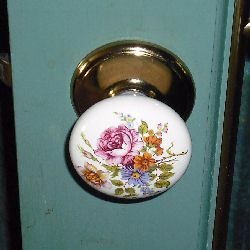 A door handle or door knob is used to open or close a door. A door handle is a lever operated device while a door knob usually is shaped like a globe or, in some older homes, an oval. Though different in appearance they both have the same function, namely to engage or disengage the latch bolt from the striker plate located in the door jamb. The center of the door handle is normally 2 3/8" or 2 3/4" away from the door edge. This is referred to as the backset. This backset is either fixed or can be adjusted to either size. The greater the backset the better because it provides more space for turning the door knob. I have seen a good number of older doors which had a backsets of six inches (150 mm). Lets have a look at some of the differences between door handles and door knobs so it is easier for you to determine which is a better choice for your needs. A tight grip is not required to operate a door handle. The elderly only have to apply a light downward pressure on the lever to open the door. It also makes it easier for children to open doors but if you are concerned about them entering certain rooms you can install a temporarily out of reach simple hook and eye lock. A door handle makes it easier to leave a room in case of an emergency. Door handles also come in handy when both hands are needed to move things from room to room. You just lean with your elbow on the lever to open the door.